Simple to install, Security Fence Company ADA-Compliant railings are aluminum reinforced vinyl or anodized aluminum providing code-compliant installations wherever needed. Create continuous code handrail on any stair or ramp. Simple to install on site. 1 - 1½" OD aluminum reinforced vinyl is ADA compliant. Patented adjustable internal joiner eliminates fittings and accommodates any angle. 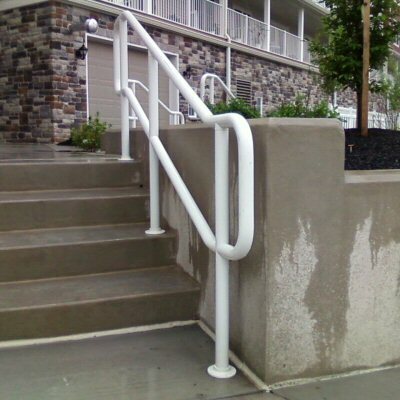 The Continuous Handrail is ADA compliant, has a variety of rail lengths and accessories to complete the system. CCRR-0163 complies with IBC, IRC and FBC. The following Westbury Railing Products are included in CCRR-0163: C10, C30, C30R, C31, C32, C33, C34 and 2-1/12” Power Post.